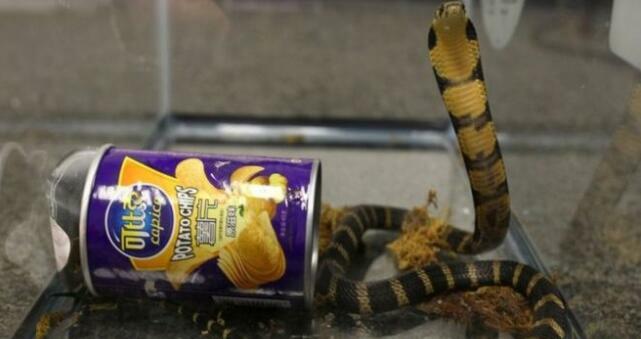 A California man was arrested after a package addressed to him was found with three live king cobras hidden inside potato chip cans, US officials said. Rodrigo Franco, 34, was arrested in Los Angeles and charged with illegally importing merchandise. 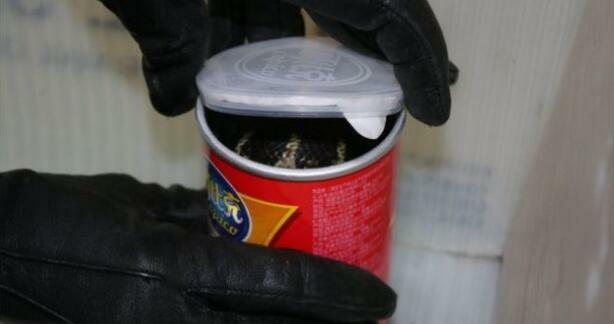 Customs officials discovered the snakes, about two-feet long, while inspecting a package that was mailed to Mr Fanco from Hong Kong in March. The shipment also contained three albino Chinese soft-shelled turtles. Federal agents seized the snakes for safety purposes but the turtles were delivered to Mr Franco at his home in Monterey Park, California. The agents served Mr Franco with a search warrant and found inside a children's bedroom at his home tanks containing a live baby Morelet's crocodile, alligator snapping turtles, a common snapping turtle and five diamond back terrapins, all of which are protected under US law, prosecutors said. Mr Franco had allegedly exchanged text messages with an individual in Asia about shipping the turtles between Hong Kong and the US, according to authorities. In those text messages, found during the search, Mr Franco also said he had previously received live cobras and planned to give five of them to the individual's relative in Virginia, according to court papers. He also admitted to a US Fish and Wildlife Service agent that he had previously imported 20 king cobras in two other shipments, but all had died in transit, court documents show. It is unclear if some of those live cobras are among those he said he would give to a relative. Two of the three cobras seized in March were receiving care at the San Diego Zoo while the third died for unknown reasons, officials told the Los Angeles Times. If convicted, Mr Franco could face up to 20 years in prison.